Vitalab is a Johannesburg based fertility clinic that has been committed to helping couples build families since 1984. We have pioneered a wholesome approach to fertility by supporting our patients medically, physically and emotionally. Our doctors are registered reproductive specialists with the South African Medical and Dental Council, with a collective experience of over 150 years. We are also the first fertility clinic to receive the coveted ISO 15189 accreditation for medical laboratories, which demonstrates that our facility meets the high standards of quality, performance, technical expertise and systems management. We do everything in our power to ensure that you arrive as a patient and leave as a parent. We understand that infertility is one of life’s most difficult challenges medically, emotionally and financially. Therefore, we have the experience, support and trained staff to help you through your fertility journey. We begin with a structured and coordinated series of investigations to understand what the cause of infertility is. Once that is established, we work closely with you to develop an individualised, holistic treatment plan in order to achieve your family dream in the shortest time frame possible. 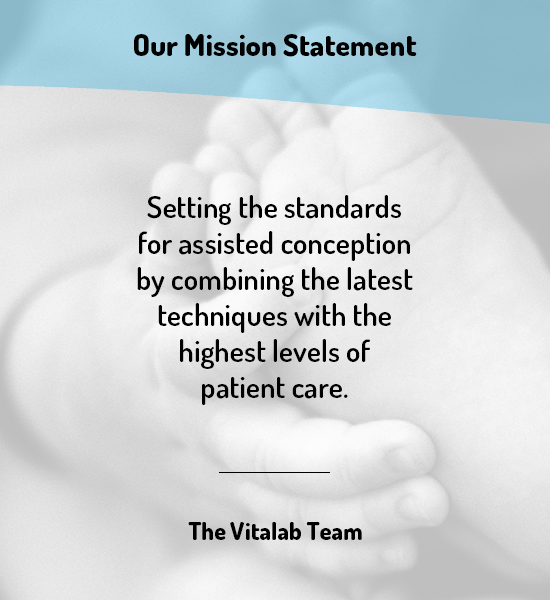 If you are looking for a fertility specialist, Vitalab’s dedicated industry leading team is here to help make your family dreams a reality with the best medical care the industry has to offer.